This lumpy, amiable shaggy dog story from the Duplass brothers is another earnest, warm-hearted comedy that marries their signature family dysfunction, mumblecore quirk to a larger, more mainstream setting. 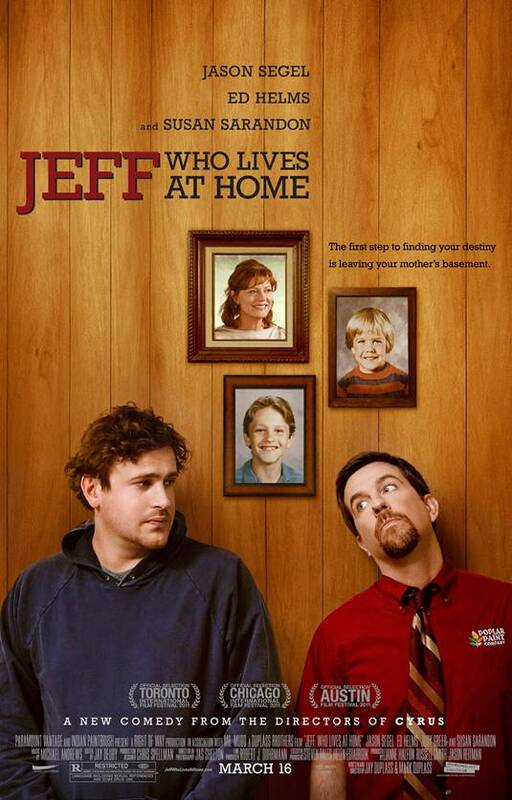 The Jeff (Jason Segel) in question is a 30-year-old slacker, who indeed lives at home, and awaits signs from the universe to guide his decision-making. Incidentally, his favorite movie we learn in a monologue set on a commode, is Signs. His older brother, Pat (Ed Helms), is a selfish twit and embarks on a quest, with Jeff, to discover if his wife (Judy Greer) is cheating on him. The boys mother (Susan Sarandon) also has a nice storyline where an anonymous admirer is sending her flirty instant messages at work. Watching her face light up as she processes being wanted, it’s a thing of beauty. The characters are all flawed, and for some they may be too annoying to sit through. The film has been accused of being aimless, but I was engaged with its plot, which kept ping-ponging from one cause to another effect scenario. The movie is really more a drama with some comedic asides, mainly due to Jeff’s stoner zen and Pat’s aggressive dickishness. Greer has an outstanding moment where she lets her character’s deep reservoir of unhappiness come out in a blinding moment of honesty, and it rang true to my ears. In fact, the entire movie feels true enough. And then it appears destiny reveals its master plan with an ending that makes your heart warm all over, championing Jeff’s mantra of optimism and interconnectedness. The simple, good-natured, sweet little movie is worth checking out. Posted on March 22, 2012, in 2012 Movies and tagged drama, ed helms, indie, jason segel, judy greer, mark duplass, mumblecore, slacker, sundance, susan sarandon. Bookmark the permalink. Leave a comment.